2) ABA wins the day! 2) Barking up the right tree, Mom! One of my clients is getting a puppy soon for the first time since the 7-year-old child was a toddler. 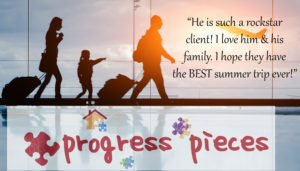 The mom asked if we could make and read a social story during sessions to help prepare him, but since this client is working toward graduation I suggested she try writing it herself. At first the mom was reluctant and joked, “But I need a social story about the dog too!” She agreed to try, however, and the next day sent me a really well-written story that hit on all the key points! I just added a few pictures and printed it for her. Go Mom!. -Aislin B.